The noise sounded once more, and Kate’s gaze fixed on the kitchen window. That side of the house was thick with trees and shrubbery. Perfect to conceal anyone wanting to sneak around the house. Holding her breath, she edged her way across the room, grateful that she’d closed the kitchen curtains. She had to just peek out to reassure herself. Reaching the window, she lifted a shaky hand. Just as she pulled back the curtain, something…or someone brushed past the window. Kate reeled back. Her gaze traveled the wall in the direction the person—if it was a person—would be moving. Toward the back door! Heart racing, she charged to the door, ignoring the pain in her knee caused by the rapid movement, and grabbed the knob, jiggling it to assure that it was secure. Terror and uncertainty paralyzed her. Should she stand her ground? Hide somewhere? Panicking, she scanned the kitchen. Vivid images she had thought she’d shut out filled her head. It had been six years, but as she grabbed a knife out of a rack on the counter she remembered crouching in the broom closet of her childhood home, gripping her mom’s sewing shears. A wave of queasiness assaulted her as she clutched the knife in front of her with trembling hands. Would she be able to use it as a weapon? All those years ago, she had known without a doubt that she would defend herself against her angry drunken stepfather if he ever came at her again. That was when she’d realized she had to leave that house for good. The sound came again, this time distinctly closer to the door. Her entire body shook with a too-familiar will to survive. I nearly jumped out of my skin, before I recognized the sound of my computer alerting me to an incoming message. I’d gotten so absorbed in the scene I was writing that my nerves were on edge and my palms were sweating a little. As I looked around my own kitchen, where—thankfully—no killer lurked outside, I chuckled in relief. My perceived danger wasn’t real, and I was perfectly safe. 1. We love feeling a sense of danger when we know we’re actually safe. A rush of adrenaline is pleasant when it’s not accompanied by the fear of actual bodily harm or even death. It’s the same reason we love roller coasters and bungee jumping. Well…some of us, anyway. 2. We like feeling smarter than the characters in a book. There’s a certain gratification in knowing that we wouldn’t be foolish enough to stay in that dark house all alone during a thunderstorm or to get stranded in our car with no cell phone. 3. We love being surprised. Of course in real life, we’d prefer the surprise of say, a bouquet of flowers, to that of a lunatic lurking behind our door. 4. We like feeling like we’ve faced down evil. It makes us feel like we’ve conquered something, even if we haven’t left the safety of our cozy armchair. 5. We’d rather solve other people’s problems than our own. We all need to escape the intensity of our own lives from time to time, and what better way than to put ourselves in the skin of someone who’s facing higher stakes than we are? And unlike in real life, we can close the book if it gets to be too much. 6. In fiction, you know the outcome is going to be good, which isn’t necessarily the case in real life. There’s something about that reassurance that the main character in a novel or a movie is going to come out okay in the end that acts like a safety net. Even if we pretend the net isn’t there, we can always sneak a reassuring peek just to be sure. Once a teenage runaway, Kate Jennings is finally getting her life together. She’s moving to picturesque Shaw Island, Washington to marry the man of her dreams—billionaire Chase Cole. Chase is everything she could want in a man. He’s handsome, smart, and funny…so what if he’s thirty years her senior? The only trouble is, the media won’t put to rest the disappearance of his previous wife. For Kate, the rumor that he might have had something to do with it pales in comparison to the dangerous past she’s on the run from. With Chase’s financial resources, she can stay safe. And alive. Josh Collins thought he was visiting Shaw Island for a relaxing weekend with friends. Until he met beautiful, mysterious Kate, the unlikely fiancée of a notorious billionaire who’s old enough to be her father. Josh feels drawn to protect this woman from the loveless marriage she’s careening toward and the deadly secret she’s refusing to reveal. Will real love find them in time to save her? 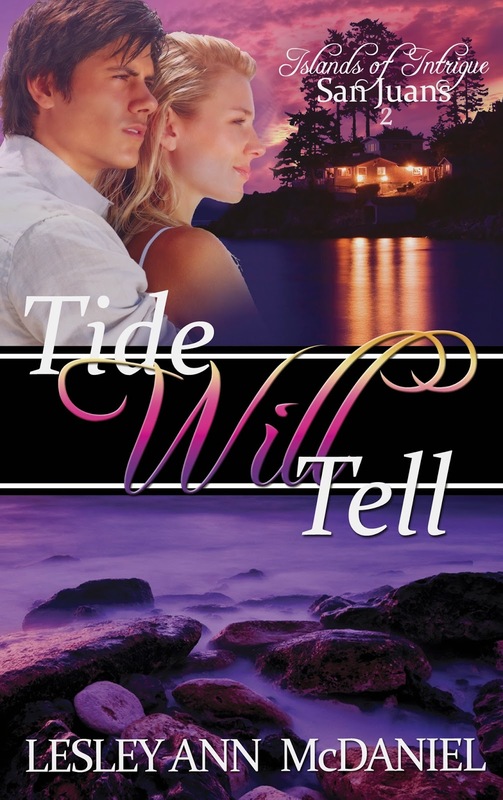 If you’d like to enter for a chance to win a free copy of Tide Will Tell, book 2 in the “Islands of Intrigue” series, leave a comment below. Why do you enjoy reading suspense? LESLEY ANN MCDANIEL is a lifelong lover of words, and theatre. While earning a degree in acting, she fell in love with theatrical costuming, and pursued that as a career while nurturing her passion for writing on the side. Through God’s guidance, she has shifted her focus to honing her skills as a writer of Women’s and Young Adult fiction. A native Montanan and a Big Sky girl at heart, Lesley now resides in the Seattle area. Visit her website at www.lesleyannmcdaniel.com or on Facebook at https://www.facebook.com/LesleyAnnMcDaniel. Giveaway ends 11:59pm EST Aug. 16th. Please supply your email in the post. You may use spaces or full text for security. (ex. jsmith at gmail dot com) If you do not wish to supply your email, or have trouble posting, please email maureen@justromanticsuspense.com with a subject title of JRS GIVEAWAY to be entered in the current giveaway. I read suspense romance just to have that kick in life when I'm down or need some thrill from adventure. I don't get out much. I'm scared of heights. I'm just a plain Jane. It just fun to image I could be that heroine in the story. I'm with you, Kai. I love to pretend I'm living on the edge, but in reality the edge of my seat is about as far as I want to go. Thanks Sue. I hope you enjoy it. It's fun as a writer to create a satisfying ending for my characters. I often wish I could do that for people in real life. I love being tense, nervous and scared when I'm reading a book! Plus, it makes the pages fly. Mystery/suspense will always be my first love and adding in romance just makes it perfect. Jonetta, me too. 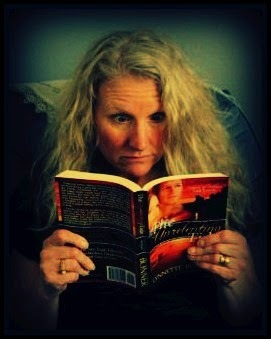 I love different genres, but romantic suspense is the one I seem to gravitate to the most. And I read faster when I have to find out what happens next. Romantic Suspense... love the bit of danger... hint of mystery... seeing the characters win over evil. Yes! I've read some books on the craft of writing that encourage you to explore giving your main character an unhappy ending. It's an interesting writing exercise, but as a reader that would just make me mad. The good guys have to win in the end. I agree. I love a good mystery that keeps me thinking that any one of the suspects could be guilty. Suspense gives you edge of the seat reading. It's a thrilling ride.